State Bank of India (SBI), the lead lender to Kingfisher Airlines, will not consider any fresh loans for the debt-laden carrier until it raises new equity itself, a senior executive of the state-owned bank said. British marque brand Jaguar Land Rover, owned by Tata Motors, will showcase the convertible concept of its latest premium SUV Range Rover Evoque, at the upcoming Geneva Motor Show next month. Led by a steep decline in SBI's market value on concerns over its exposure to Kingfisher Airlines, the combined market capitalisation of five of the top 10 blue chip companies eroded by Rs 20,409.84 crore. Q. We are running a textile industry (100% export-oriented unit). We got subsidy from the Punjab Govt for investment on modernisation and expansion of machinery. At the end of the closing year, the whole amount was deducted from the machinery account and depreciation was claimed as per the law. Kindly intimate if this subsidy would be considered as taxable income. If so, under what section? Investors are switching from gold to silver as soaring prices of the yellow metal dull appetite of retail buyers. On the other hand, industrial demand for silver continues to remain strong thereby increasing the upside potential of the white metal. Property consultants and real estate developers have demanded industry status to the realty sector in the forthcoming Budget. They have also sought incentives to promote affordable housing segment and an increase in the tax exemption on home loans. A good and comprehensive car insurance policy is a must for every car owner and given the increasing cost of everything around, it makes perfect sense to aptly budget all the things that are important to us. So, if you are happy with your car insurance company on all fronts but not comfortable shelling out a high premium, then you should definitely look around and check what other companies are offering. And the effort you put in is definitely going to pay off by the savings you make in the premiums. The week began with a holiday and then we had yet another terrific Tuesday, but the markets ran out of breath thereafter. We had three consecutive days of fall and the markets fell for their first weekly loss since the beginning of the year. The BSE Sensex lost 365.78 points or 2% to close at 17,923.57 points. The NSE Nifty was a bigger loser with loss of 135 points or 2.43% to close at 5,429.30 points. The broader indices lost more with thee BSE100, BSE200 and BSE500 losing 2.82%, 2.81% and 2.90% respectively. The BSE Midcap and BSE Smallcap lost even more ground at 3.74% and 3.65% respectively. The top sectoral losers were BSE Realty down 7.27% and BSE Bankex down 5.24%. The BSE IT gained 0.67%. In individual stocks, REC lost 17.37%, PFC lost 13.09%, SBI lost 8.69%, Axis Bank lost 7.49% while ICICI Bank lost 5.09%. 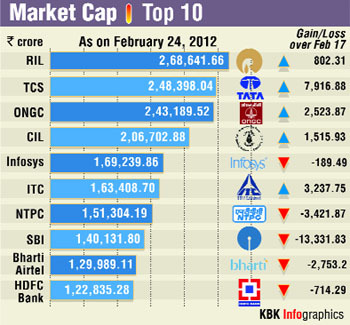 Among the few gainers were TCS up 3.29% and ITC up 2.02%. An option gives you the right to buy or sell the underlying asset . A call option gives you right to buy the underlying asset while a put option gives you the right to sell. An option contract specifies the strike price, that is, the price at which you can buy or sell the underlying asset. In Futures, you buy a contract which will have a specific lot size of shares. When you buy a Futures contract, you don’t pay the entire value of the contract but just the margin. Open interest is the the total number of contracts not closed or delivered on a particular day. SBI is studying a viability report prepared by its investment banking arm, SBI Capital Markets, and any decision on further lending to Kingfisher will be based on that as well as conditional on an infusion of funds into the airline, Deputy Managing Director R. Venkatachalam told Reuters on Saturday. Desperately strapped for cash, Kingfisher stands on the brink of collapse after multiple flight cancellations and the resignation of dozens of its pilots. Kingfisher, which has not turned a profit since it was founded in 2005 and is carrying debt of at least $1.3 billion, has asked for 20-30 billion rupees in loans from banks to carry out its day-to-day operations. "Everything depends on equity infusion - how much comes in, whether that will meet the requirements. First it has to come," Venkatachalam said. Venkatachalam heads the mid-corporate division of the bank, which makes loans upwards of 250 million rupees to companies that have a turnover of at least 1 billion rupees. SBI, which accounts for nearly a quarter of India's loans and deposits, will wait for some "policy evolution" towards the aviation sector before taking any fresh exposures in airlines, he said. The government has made some regulatory changes in the sector recently, allowing airlines to import fuel directly, which has lowered their costs, and given more leeway for private carriers to fly overseas. But there has been no indication that it is planning to rescue Kingfisher even though state-run banks own about one-fifth of its equity and three-quarters of its debt. Venkatachalam said there was no government pressure on the consortium of banks to bail Kingfisher out. "In all these cases it can't be one-sided. They have to get the capital first. Without that it will definitely be difficult for banks to lend," said Venkatachalam, who said he was upset by "sensational" and "unethical" media reports about SBI riding to Kingfisher's rescue. Last week, several newspapers reported that SBI was poised to offer Kingfisher fresh funds, putting the sum variously between 2 billion and 16.5 billion rupees, and one daily said that the money has already been given to the airline. 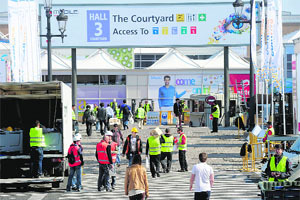 The company said "Land Rover will unveil a Range Rover Evoque convertible concept at the 2012 Geneva Motor Show. The convertible concept vehicle will explore the potential for the world's first premium convertible SUV". The company will showcase the concept SUV to judge the reaction of public and to assess the potential for launching it commercially, the company said, adding that there was no plan yet to roll it out. The company had introduced the Evoque - produced at Land Rover's Halewood manufacturing plant - about six months ago and was launched in India in November 2011. The company had received 18,000 advance orders for the vehicle before the launch. It has been on sale for six months in 170 markets globally. The company had launched the Evoque in India in three diesel and one petrol versions, priced at Rs 44.75 lakh onwards (ex-showroom Mumbai). Country’s largest lender SBI’s market capitalisation (m-cap) dropped by Rs 13,332 crore to Rs 1,40,131 crore. Shares of the company had plunged by over 8 per cent last week on concerns over its exposure to cash-strapped Kingfisher Airlines and reports of public sector lender giving fresh loans to the debt-ridden carrier. State-run NTPC's m-cap also dipped by Rs 3,422 crore to Rs 1,51,304 crore, while Bharti Airtel's worth declined by Rs 2,753 crore to Rs 1,29,989 crore last week. HDFC Bank saw an erosion of Rs 712.84 crore from its value which was at Rs 1,22,755.16 crore, while IT major Infosys lost Rs 190 crore from its m-cap which stood at Rs 1,69,239 crore at close on last Friday. In contrast, corporate leader Reliance Industries, IT bellwether TCS, state-owned ONGC, Coal India and FMCG giant ITC reported gains in market value. Market worth of Reliance Industries surged by Rs 802 crore to Rs 2,68,625 crore, while TCS added Rs 7,917 crore to its m-cap which stood at Rs 2,48,400 crore as on Friday last week. A. The treatment given by you in the books of account is correct and is in accordance with the provisions of Section 43 of the Act read with Explanation 10 to the said section. Subsidy so received is not taxable as income but is required to be deducted from the cost of the asset so as to ascertain the actual cost for the purpose of allowing depreciation under the provisions of the Act. Q. What is New Pension System (NPS)? b) Does it come u/s 80C? c) How much amount can be deposited in the scheme? d) What is the duration of scheme? e) What is the rate of interest and is interest income taxable? (b) In any other case 10% of the gross total income of such individual assessee. The maximum deduction allowable under Section 80C, Section 80CCC and Section 80CCD of the Act remains at Rs 1,00,000. It may be added that Section 80CCC applies to an individual assessee who has paid or deposited any amount out of his income chargeable to tax to effect or keep in force a contract for any annuity plans of LIC or any other insurer. The amount received on the closure or opting out of the scheme is taxable as income in the hands of an assessee. Q. I am 76 years old and a pensioner of the IAF. I am getting my pension plus an element of disability (war) i.e. 40% of pension. Please advise the I-T exemption limits for a senior citizen and also for my element of war disability pension (Rs 2,352), which is separate, unrelated to the pension of retirement, but clubbed with it to my normal superannuation pension. A. (a) The maximum amount not chargeable to tax in case of a senior citizen for Assessment Year 2012-13 is Rs 2,50,000. (b) The disability pension received by Army personnel is not taxable. This is in accordance with letter No. F. No. 200/51/99-ITA-I dated 6th May, 2000 written by Samar Bhadra, Under Secretary to Govt. of India, to Sudhakar Shukla, Director (Pens), Govt. of India, Ministry of Defence, Department of Defence, New Delhi. Q. I have invested some amount in Senior Citizen Savings Scheme (SCSS) and getting 9% interest P.A. thereon. I am doubtful about the interest as to whether it is exempt from tax or not. In other words, whether or not it is included in the savings exempt under Section 80C of the I-T Act. Please clarify. A. The amount of interest on Senior Citizen Savings Scheme Account is taxable and no exemption is available in respect thereof under any provisions of the Act. Q. An assessee made a fixed deposit without appointing a nominee with a scheduled bank for availing deduction u/s 80C as per the Income Tax Act 1961. The lock-in period of the said fixed deposit is five years. In case the assessee expires before the completion of five years as stipulated in the fixed deposit, can the legal heirs ask the bank to refund the said fixed deposit. I understand it is possible as per the guidelines laid down under the said scheme whereas the bank officials concerned are denying the same. If your answer to the above is yes, please let me know under which rule/circular it is allowed. A. Clause 14 of the Bank Term Deposit Scheme 2006 provides that if a holder of a term deposit dies and there is no nomination in force at the time of the death, the manager of the bank from where the term deposit was issued, shall pay the sum due to the legal heirs of the deceased. The scheme does not contain any provisions for premature payment of the term deposit in case of death of the depositor before the completion of five years. The clause referred to herein above makes a reference to the ‘sum due to deceased’ which can be after the completion of the term. "The trade expects silver prices to breach the Rs 1 lakh mark per kg later in the year," says Arpit Ranka, a bullion dealer in Mumbai. With even the Bombay Bullion Association endorsing such views, speculators are tanking up on the white metal sending prices even more upwards. At present, silver is priced at around Rs 58,000 per kg. "There is a lot of buying coming in silver as people expect prices to shoot up," says Prithviraj Kothari, president, BBA. According to him, India is expected to import 5,000 tonnes of silver this year as against 4,800 tonnes in 2011. Till recently, India was the world's largest importer of gold and silver but ceded the pole position in the yellow metal to China after the Indian government imposed import duty on gold late last year. India imported gold worth $29 billion in 2011 but since then demand has dried up following the imposition of import duties. Though the trade sees a lot of silver being bought in rural India, industrial demand for silver continues to grow as well. With the Met department forecasting a good monsoon, speculators are tanking up on silver in the hope that the demand for the white metal would go up later in the year, say traders. India produces just 207 tonnes of silver with the rest of the supply coming from imports. To boost supply, they have also asked for a single-window clearance for real estate development projects and FDI in multi-brand retail to create demand for retail space in shopping malls. "Grant industry status to real estate, since the sector is a major driver for economic growth and generates countless jobs across its various verticals and associated industries," Global Property Consultant Jones Lang LaSalle India Chairman and Country Head Anuj Puri said. 1 A quick comparison: Conduct a detailed comparison of what each insurance company has to offer and the charges they levy. There are many comparison websites which make this process easier through their online comparison engines. Go through the various parameters of policies vis-à-vis the cost while making your choice. Do not fall for plans that come with low premiums immediately. Take some time to evaluate the one which gives you the best deal for the premium it charges. 2 Read about the insurance company: It is always helpful to do a first level check of experience of customers with the insurance company. Now there are always people who will like a particular insurance company and a good number of people who will dislike the same insurance company. Your approach to handle this mixed opinion is to check the reasoning given by them for liking or disliking the company. 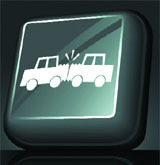 The main idea is to understand how seriously the insurance company handles your claim. There are many websites who carry consumer complaints, reviews, feedback and even word of mouth opinions in this regard. 3 Insured Declared Value (IDV): All of us like those companies who offer low premiums for a (perceived) similar product. And once we see the price difference with other companies, it builds a bias in our minds about that company which has the lowest premium quote. But we should keep ourselves away from the low premium trap. Many representatives offer us low premium by reducing the IDV of the vehicle and we think that the premium is low because the company is offering a discount. That’s not the case always. Whenever you are comparing the premium quotes of two or more insurance companies, also collect the IDV they have considered for calculating the premium. 4 Cashless claim settlement: Nowadays even though almost all the companies have cashless claim settlement facility, it is important to check the list of garages that are covered in their network list. 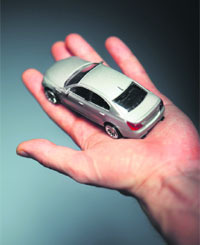 Cashless settlement for motor insurance is an easy way to settle claims. Cashless settlements do not require any authorisation for claims and hence one need not run around to file claims. Check to see if the insurance company’s authorised garage for cashless settlement is the one which is proximate to your place and well equipped. The garages where you can give your car for repair should be associated with your insurance company otherwise you will end up paying them the amount and applying for a reimbursement from the insurance company. This would become very difficult and stressful if the claim amount is large. 5 Read product leaflet carefully: This is probably the most boring task of all but one of the most important one. It is indeed important to read the terms and conditions of the policy once. The knowledge of company’s processes and rules helps us to communicate with their teams effectively. 6 Claim process: Last but not least, and the most important process for evaluation. You should understand as to what is the process of the insurance company to register the claim. Do they have a centralised call centre to take in your request or do you have to simply drop the car to their authorised service centre and they will manage it from there? Do they take a day or two to survey and approve claim or do they take a week? This information is important because each company has their own timeframes within which claim has to be filed and sometimes motor documents like Motor Collision Report, etc. from the nearest police station is required. Depreciation cover, invoice price cover, medical expenses, daily hospital cash, ambulance charges, roadside assistance, daily transportation allowance while the car is under repair, lost key/lock replacement, no-claim bonus protection, repair of rubber parts, glass, fibre and plastic, loss of baggage and personal belongings cover. While the to-dos are important, one should not ignore the exclusions in the policy as well. The standard exclusions of a motor insurance policy are: Normal wear, tear and general aging of the vehicle, depreciation or any consequential loss, mechanical/electrical breakdown, wear and tear of consumables like tyres and tubes, vehicles, including cars being used otherwise than in accordance with limitations as to use, damage to/by a person driving any vehicles or cars without a valid licence, damage to/by a person driving the vehicle under the influence of drugs or liquor, loss/damage due to war, mutiny or nuclear risk. The writer is vice-president of MyInsuranceClub.com, an insurance price and features comparison site. The views expressed are his own. The week saw expiry of February series passing off but very clearly the rollover was significantly lower than the previous month indicating that the longs were under pressure and therefore the market vulnerable. The selloff on Friday was largely due to this position and global cues were not at all indicative of the pressure witnessed in India. Friday saw a huge deal happening in HDFC where Citibank sold its entire stake of 9.85% or 14.53 crore shares at an average price of Rs 657.56 per share. The total value of the deal was a staggering Rs 9,554.34 crore. This is a sale by FIIs and has apparently not been reported in the daily sales of institutional trades. Even assuming that all the shares were bought by FIIs the figure would at best be zero but certainly not be positive to the extent of Rs 9,000 crore. This week, therefore, the institutional trade figure of the week is not been given as it would distort numbers completely. MCX launched its offer for sale during the week which was a grand success. The issue was subscribed an overall 53.89 times with the QIB book subscribed 49.12 times, HNI category 150.35 times and the retail portion 24.14 times. The issue would be priced at the top end of the price band of Rs 1,032. The grey market premium is in the range of Rs 350 to 375. The success of this IPO which has come after a gap of almost five months clearly indicates that there is appetite for fresh issue and if there are proper valuations and marketing of the issue, investors are willing to subscribe to issues. The Indian Rupee continued to appreciate and closed at Rs 48.94 for the week. The delisting of Alfa Laval by reverse book-building was completed last week and the market price and movement indicates that the discovered price would be accepted by the parent. The discovered price would be in the region of Rs 3,800-3,900. Similar delisting rumours by Oracle Financial Services saw the stock gain 16.45% to close at Rs 2,583. Sterlite Industries would be merged with Sesa Goa and the existing shareholders of Sterlite Industries would be given 0.6 share for every share of Sterlite Industries in the merged entity Sesa Sterlite. The interest of Cairn India would also be transferred into this company along with the debt and this new entity would be a natural resource company with interest in mining and energy. The price movement in the stocks would be interesting to watch in the coming week. The week ahead would be extremely choppy and unlike the uni-direction that we have seen so far in the last eight weeks. There is likely to be further correction but the bulls having made a lot of money this year would not give in so easily. The BSE Sensex has support at 17,782, then at 17,673, then at 17,579, then at 17,433 and finally at 17,258. The NSE Nifty has support at 5,383 points, then at 5,347, then at 5,268, then at 5,217 and finally at 5,174 points. The week would be choppy and caution is advised. The writer is founder of KRIS, an investment advisory firm. The views expressed are his own.